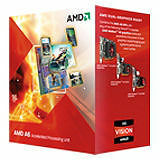 VISION A8 Technology with AMD's fastest APU, the AMD Quad-Core A8 Series Accelerated Processor enables outstanding HD performance, incredible quad-core processing and ultra-realistic 3D gaming capabilities. Run memory-hungry applications with ease. Immerse yourself in lifelike 3D games on multiple monitors simultaneously. Watch your favorite Blu-ray movies in breathtaking detail. And stay cool doing it all. AMD enables superbly energy-efficient desktops and notebooks with "all-day" battery.